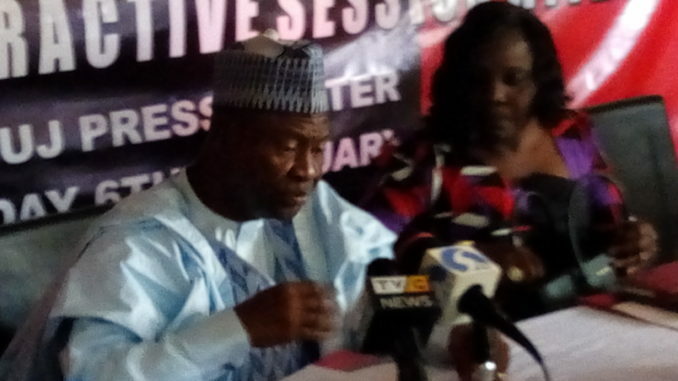 The Director General of the Industrial Training Fund (ITF), Sir, Joseph Ari (KSM) has disclosed that the Training Fund has been able to train over 20Million Nigerians under his watch, to meet the manpower needs of the country’s private and public sectors of the economy. You would recall that the ITF was established on the 8th of October, 1971, by decree no. 47, as amended in 2011, with the mandate to among others provide, promote and encourage the acquisition of skills in industry and commerce with a view to generating a pool of indigenous trained manpower sufficient to meet the needs of the private and public sectors of the economy. 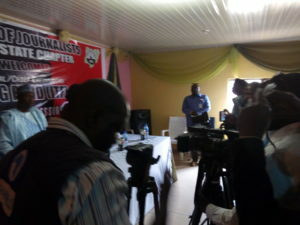 The D-G in an interactive session with Journalists in Plateau State, at the NUJ Press Center today said, despite this clearly challenge and tasking mandate, the ITF vigorously pursued and trained over 20 million Nigerians that are today manning key sectors of the National economy. Adding that, “From our skills intervention programmes, which are accessible to all Nigerians particularly the youth, to our tailor-made skills acquisition and other direct training services that are implemented by our 43 Industrial Skills Training Centres and Area Offices nationwide, we are continually and consistently driving Nigeria to be amongst the skills hub of the world”. To achieve this, according to the Sir Ari, the incumbent Management of the ITF in 2016 unveiled one of its most ambitious plans since establishment, tagged: the ITF Reviewed Vision: Strategies for Mandate Actualisation. The six-year plan, was divided into quick wins, short, medium and long-term goals. The implementation of the plan commenced in 2016 and will terminate in 2022. 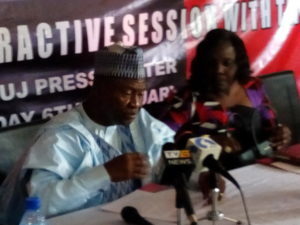 He said, “The overriding objectives of the plan was to accelerate the impartation of technical vocational skills to Nigerians, aggressively address service challenges, tackle infrastructural deficits, expand revenue generation and a gamut of other strictures hamstringing the actualisation of the Fund’s mandate”. “At this juncture, I must appreciate the invaluable and indeed critical role the media has played in facilitating and driving the achievements of the mandate of the Industrial Training Fund. In this regard, the membership of the NUJ Plateau State Chapter, individually and collectively deserve a very special mention. 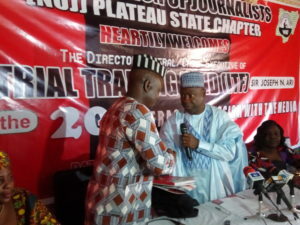 Your continuous reportage, analyses and regular mentions have not only been vital in our efforts to enshrine training consciousness in Nigerians but have also proved invaluable in sensitising Nigerians on our current efforts and that of the Federal Government to create jobs, reduce poverty and grow the National economy through accelerated skills acquisition. Such sensitisation and enlightenment with regards to skills acquisition is especially important in view of subsisting prejudices and perception of hands-on trades as endeavours and preserve for the down trodden and never-do-wells. That today, an increasing number of Nigerians across the social spectrum are desirous of acquiring skills is a huge credit to you. “Therefore, on behalf of the Governing Council, Management and entire staff of the ITF, I want to thank you for such continuous support”. 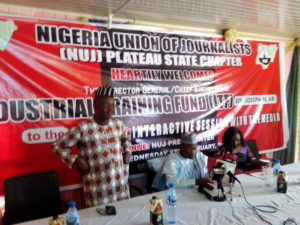 TEXT OF AN ADDRESS BY SIR JOSEPH N. ARI, DIRECTOR-GENERAL/CHIEF EXECUTIVE OF THE INDUSTRIAL TRAINING FUND (ITF) AT THE PRESS BRIEFING FOR THE PLATEAU STATE CHAPTER OF THE NIGERIA UNION OF JOURNALISTS (NUJ) ON WEDNESDAY, FEBRUARY 6, 2019 AT THE NUJ PRESS CENTRE, JOS PLATEAU STATE. I will start my address by expressing gratitude to God Almighty for protecting and guiding us through the roughs and toughs of 2018 for us to be here today. I also wish to appreciate and welcome the Executive and the cream of the NUJ, Plateau State Chapter, for honouring our invitation despite the short notice. At this juncture, I must appreciate the invaluable and indeed critical role the media has played in facilitating and driving the achievements of the mandate of the Industrial Training Fund. In this regard, the membership of the NUJ Plateau State Chapter, individually and collectively deserve a very special mention. Your continuous reportage, analyses and regular mentions have not only been vital in our efforts to enshrine training consciousness in Nigerians but have also proved invaluable in sensitising Nigerians on our current efforts and that of the Federal Government to create jobs, reduce poverty and grow the National economy through accelerated skills acquisition. Such sensitisation and enlightenment with regards to skills acquisition is especially important in view of subsisting prejudices and perception of hands-on trades as endeavours and preserve for the down trodden and never-do-wells. That today, an increasing number of Nigerians across the social spectrum are desirous of acquiring skills is a huge credit to you. Therefore, on behalf of the Governing Council, Management and entire staff of the ITF, I want to thank you for such continuous support. Ladies and Gentlemen, permit me at this juncture to briefly introduce the ITF. The ITF was established on the 8th of October, 1971, by decree no. 47, as amended in 2011, with the mandate to among others provide, promote and encourage the acquisition of skills in industry and commerce with a view to generating a pool of indigenous trained manpower sufficient to meet the needs of the private and public sectors of the economy. Despite this clearly challenging and no doubt tasking mandate, it vigorously pursued its realisation by training over 20 million Nigerians that are today manning key sectors of the National economy. From our skills intervention programmes, which are accessible to all Nigerians particularly the youth, to our tailor-made skills acquisition and other direct training services that are implemented by our 43 Industrial Skills Training Centres and Area Offices nationwide, we are continually and consistently driving Nigeria to be amongst the skills hub of the world. As we had informed you at our earlier briefings, in line with the policy direction of President Muhammadu Buhari, GCFR, the Industrial Training Fund re-articulated and refocused its activities with greater emphasis on skills acquisition in order to create jobs to stem rampant unemployment and breed a new generation of entrepreneurs in order to transform the economic landscape of the country. To achieve this, the incumbent management in 2016 unveiled one of its most ambitious plans since establishment. Tagged the ITF Reviewed Vision: Strategies for Mandate Actualisation, the six-year plan was divided into quick wins, short, medium and long-term goals. The implementation of the plan commenced in 2016 and will terminate in 2022. The overriding objectives of the plan was to accelerate the impartation of technical vocational skills to Nigerians, aggressively address service challenges, tackle infrastructural deficits, expand revenue generation and a gamut of other strictures hamstringing the actualisation of the Fund’s mandate. More than two years into its implementation, I am delighted to announce to you that, it has exceeded expectation by training over 450,000 Nigerians, who are today earning sustainable livelihoods as paid employees, or as entrepreneurs that are even employing others. To ensure achievement of the plan, the ITF expanded existing skills acquisition programmes and introduced new initiatives. 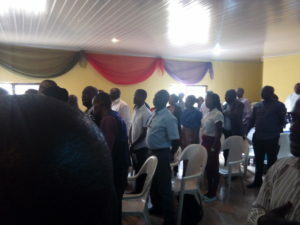 The programmes include the National Industrial Skills Development Programme (NISDP), the Women Skills Empowerment Programme (WOSEP), Passion to Profession Programme (P2PP) or Training on Wheels, the Construction Skills Empowerment Programme (CONSEP), the Skills Training and Empowerment Programme for Physically Challenged (STEPP-C), Agri-preneurship among several others. The aforementioned programmes equipped Nigerians across the country with skills in trades and vocations such as Welding and Fabrication, Tailoring and Fashion Designing and Plumbing and Pipefitting. Event Management, Cosmetology, Poultry Farming, Bead Making, Baking and Pastry, Soap/Disinfectant/Detergent Making, Hair Making, Food Processing, Tailoring and Fashion Design. Others included Tie and Dye, Electrical Installation, Plaster of Paris, Brick Making and Carpentary. It is also worthy of note that, unlike in the past where the ITF depended on State Governments and other collaborating bodies to empower trainees with start-up kits, all the beneficiaries of the ITF skills programmes were provided with start-up kits by the Fund. The decision to provide start-up packs was based on results of our monitoring and evaluation/tracer studies of earlier phases, which revealed that in all cases where the trainees were provided with the kits, over 90 percent earned reasonable livelihoods as entrepreneurs. Despite our efforts and those of the Federal Government, the National Bureau of Statistics (NBS) Report of the 3rd quarter of 2018 revealed that just as the number of the economically active or working age (15-64 years) grew from 110.3 million to 111.1 million, the number of the unemployed equally appreciated from 11.92 million in the first quarter to 13.55 and 15.99 in the second and third quarters. This is despite the fact that a Skills Gap Assessment in Six Priority Sectors of the Nigerian Economy, which was conducted by the ITF in conjunction with the United Nations Industrial Development Organisation (UNIDO) that was presented to stakeholders in Abuja in April, 2018, showed that although vacancies existed in all sectors surveyed, they were being filled by persons other than Nigerians, because of the lack of requisite skills. Specifically, the report indicated that despite spiraling unemployment, 925 trades were difficult and hard to fill in the country’s labour market. The breakdown showed that 19.7% vacancies were in the housing sector, 13.9% in petrochemical sector, 14.7% in other goods, 11.4% in the auto industry, 10.3% in textiles, 10.1% in steel, 8.9% in the services sector and 3.3% in leather industry. The report also noted that 15.7 % of all hard to fill vacancies were due to lack of technical skills, 11.8% due to lack of basic IT skills, 9.2% due to lack of advanced IT skills and between 9.2% and 7.5% of the vacancies were due to the lack of requisite soft skills. 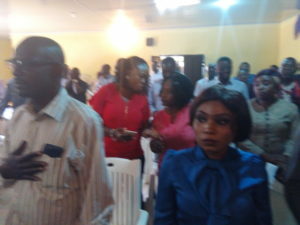 Together, the programmes trained about 300,000 Nigerians that were all empowered with start-up packs. Our commitment to skills acquisition for job creation did not, however, distract us from the performance of our key functions like Research and Curriculum Development, the Students Industrial Work Experience Scheme (SIWES), Reimbursements and development of key infrastructure. In the area of Research and Curriculum Development, which are vital functions in the Fund, we conducted two Skills Gaps Surveys: Skills Gap in Metals and solid Minerals Industry, and Skills Gap Assessment on the Agro-Allied Industry, which were formally presented to stakeholders. In programmes development, the Fund developed new programmes and also reviewed several others. The programmes were developed on the identified training needs of our clients. In line with its enabling Act, the incumbent management ensured that all contributing employers that remitted their contributions to the Fund were reimbursed provided they met the conditions for such reimbursement including the payment in full of their annual training contribution, training of their workforce across all cadres, presentation of evidence of training, acceptance of students on the Students Industrial Work Experience Scheme (SIWES) and application for reimbursement within the stipulated period, among others. In all, a total of 510 companies were reimbursed to the tune of N6,587,941,996.45 which is the biggest payout to contributing employers as reimbursement in a calendar year since the establishment of the ITF. Our commitment is to continue to reimburse our contributors provided they meet the criteria for the payments. All these projects will be commissioned this year. As earlier mentioned, despite the best efforts of governments at all levels, unemployment has continued to rise. Against this backdrop, therefore, we have resolved to step up our skills acquisition efforts in 2019 so that more Nigerians will acquire skills for employability and entrepreneurship. In this regard, we shall expand intake for our existing programmes and introduce new ones. As an indication of our tempo this year, we have commenced the implementation of an information and communication programme called the Information Technology Skills Empowerment Programme (ISEP). The programme is designed to equip Nigerian youths with the needed Information and Communication Technology skills for job creation. The programme is currently on-going in seven states namely; Plateau, Bauchi, Kaduna, Ondo, Imo and Cross River States. To ensure that members of our workforce, who are saddled with the responsibility of this training have the required capacity to adequately carryout the training, 30 staff of the ITF were trained at the Galilee International Management Institute of Israel in all skills along the Agricultural value chain. Further more, you will recall that in December 2018, the Fund graduated 30 youths in the Passion 2 Profession Programme (P2PP) in Shendam, where they were trained in garment making using the Fund’s state of the art Mobile Training Van. This year, we will be replicating the same training programme in Pankshin, Langtang, Mangu, Barkin Ladi and Jos. Other existing programmes like the NISDP, STEPP-C, WOSEP, CONSEP, will be expanded and occasionally may run several streams so that more Nigerians will acquire skills for employability and entrepreneurship. Ladies and Gentlemen, with the number of Nigerians that are currently unemployed, the 300,000 people the Fund has trained in 2018 may appear like a drop of water in the ocean. It is in this regard that I will seize this opportunity to call on State Governments and other stakeholders to sponsor additional trainees for our skills acquisition programmes. Such sponsorship will entail payment of monthly stipends to trainees, payment of master craftsmen allowance and provision of start-up kits to trainees. I also want to stress that tackling unemployment through skills acquisition cannot and should not be viewed as the sole responsibility of the ITF and other agencies of the Federal Government alone. The co-operation and collaboration of all state Governments, the Organised Private Sector (OPS), politicians and other stakeholders will be critical for a multiplier effect. Our doors are, therefore, wide open for collaboration in any aspect of human capacity development and vocational and technical skills training. As a very important vehicle for information dissemination, agenda setting and opinion moulding, it is the media’s responsibility to sensitise Nigerians on the value of the acquisition of technical skills. It is also vital that you ensure that Governments at all levels appreciate the critical place of skills acquisition in not just tackling unemployment but also developing their societies as a whole thus the need for accurate and adequate reportage of the activities of the Industrial Training Fund. I want to appreciate you for honouring our invitation and do hope that you will use the instruments available to you for the cause of the development of our great nation.